Independence Day is generally seen as a fun event for all involved, with barbecues, bonfires and fireworks. But this holiday isn't for everybody --especially not animals. 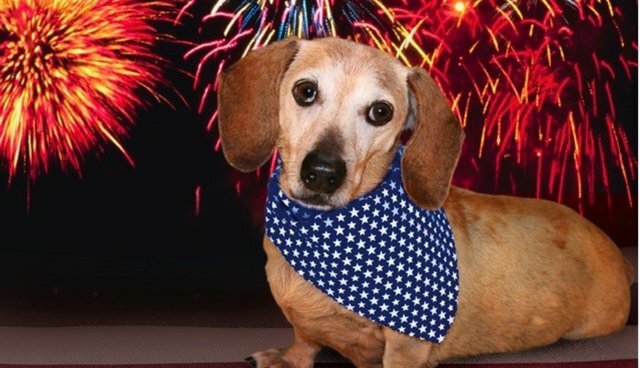 The loud noises, flashing lights and smell of sulfur can be terrifying for cats and dogs; and every year, hundreds of pets are either lost or injured due to 4th of July fireworks. However, there are safety measures and precautions that can be taken to ensure that your pets remain secure during celebrations. BASIC PRECAUTIONS If you're going out for Independence Day, leave pets at home and have someone there to look after them while you're gone. Keep them indoors, because sometimes not even a securely fenced yard can keep in an animal fleeing in terror. If you're staying home, and there's going to be fireworks in your area, keep a detailed schedule of when and where. Call your neighbors to ask when they plan to fire them off. That way you can be prepared ahead of time. Whether you're staying in or going out, make sure your pets have their collars and identification tags with contact information on them. If they're microchipped, make sure the data is up to date. Also, have current photos of them on hand in case they go missing. SAFE ROOMS Keep your pets in a "safe room" until the fireworks are over; preferably an interior room with no windows. If you can't get them into a windowless room, close the curtains so they don't see any flashes. Be sure to keep lights on, as a dark room might make the loud noises doubly frightening. Make the room as familiar, homey and comfortable as possible: set up pet beds and provide food, water and toys (as well as a litter box, if it's a cat). If you think noises might relax them, turn on the TV or play some music to distract them; maybe a CD with soothing nature sounds. Remove sharp objects, decorative items or anything else that could injure them if they get scared and start running around and knocking things over. If they scratch or bite you in a state of panic, stay calm and be gentle but firm. Remember it's up to you to provide a calming, stable presence for them. While you should never punish a pet for being afraid, try not to coddle them too much, either. That would only confirm their suspicion that something is wrong, and thus increase their anxiety. Instead, distract them with games. Give your dog their favorite chew toy, or dangle some string for your cat. AFTERMATH Even after the fireworks are over, your pet might have some lingering anxiety. Release them from the safe room and let them wander the house; but don't let them outdoors anytime soon, in case someone out there decides to shoot off just one more firecracker. Observe their behavior for signs of stress. Stressed dogs and cats may cling to you, run and hide somewhere, refuse to eat or urinate or defecate in the house. Dogs in particular might bark a lot, whimper, tremble or pace. Before letting them back outside, go out in the yard and clean up any sparklers, firecrackers or other broken or dangerous objects. Then open a window and let your cat or dog look out and see that there's nothing wrong. Take your dog for a walk and show them it's safe. Above all, be mindful, attentive, and patient. What's fun and exciting for you can be frightening and dangerous for them, so be there for your pets when they need you.